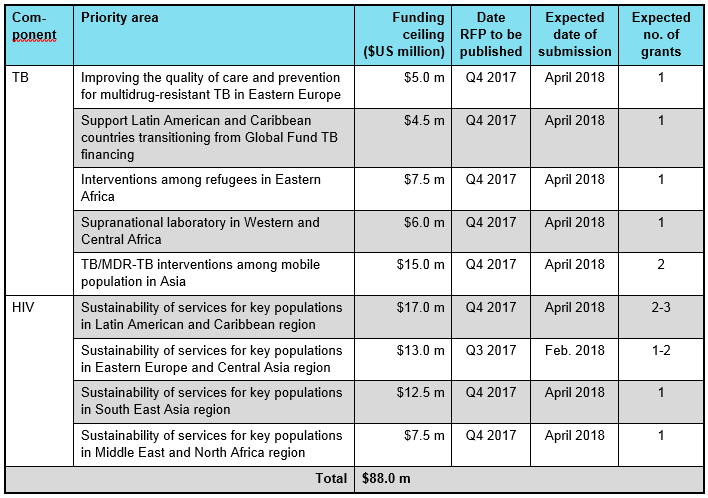 The Global Fund has unveiled its plans for the $260 million earmarked for multi-country approaches in the 2017-2019 allocations. The multi-country funding is part of a larger pot of money ($800 million) set aside for catalytic investments. In addition to the multi-country approaches, the catalytic investments include matching funds and strategic initiatives (see GFO articles here and here). The purpose of the multi-country funding is to address a limited number of priority issues that cannot be addressed through country allocations alone and that affect several countries in a given region. The Global Fund recently posted on its website a general description of how this money will be spent, along with an FAQ document and a guidance note. One multi-country project has already reached the grant-making stage: the second phase of the Regional Artemisinin-resistance Initiative (RAI) in the Mekong Region of Southeast Asia. By far the largest single project, the RAI will receive $119 million (46% of the total budget). For the multi-country funding, the Global Fund identified a key strategic priority for each disease. See Table 1 for a list of the strategic priorities and each one’s share of the multi-country funding. Within each strategic priority are specific priority areas. The Global Fund is using a combination of pre-identified applicants and a competitive application process to address the specific priority areas. For four of the priority areas (two each for malaria and TB), the Fund will invite a pre-identified applicant to develop a funding request that addresses the defined objectives and regional focus. See Table 2 for details. 1 Covers Belize, Costa Rica, El Salvador, Guatemala, Honduras, Nicaragua, Panama, Dominican Republic and Haiti. 2 Covers Myanmar, Thailand, Laos, Cambodia and Vietnam. 3 Covers at least Botswana, Lesotho, Malawi, Mozambique, Namibia, South Africa, Swaziland, Tanzania, Zambia and Zimbabwe. The Global Fund said that the pre-identified applicants will be defined in regional dialogue processes involving key stakeholders, led by the Secretariat. These applicants will be organizations that are fairly prominent in the region. They could include current regional grant recipients. For another nine priority areas (five for TB and four for HIV), the Fund will publish requests for proposals and will invite eligible applicants to respond. See Table 3 for details. In general, suitable civil society, and community-based organizations, international organizations, regional networks, and regional co-ordination mechanisms are eligible to apply for funding under multi-country priorities. For priority areas with a competitive application process, requests for proposal (RFPs) will be published on the Global Fund website four to six months prior to the expected submission window in order to allow for a robust regional dialogue. With respect to the priority area for TB/MDR-TB interventions among mobile populations in Asia, the aims are to strengthen service delivery intervention for early diagnosis and effective treatment of TB and MDR-TB among cross-border migrants, including pre-departure and arrival screening; and to strengthen laboratory capacities, patient referral and follow-up for treatment completion and community engagement. This priority area has two streams. The first one focuses on covering countries hosting and repatriating Afghan refugees (mainly Afghanistan, Pakistan and Iran). The ceiling for this stream is $5.0 million. The second one focuses on addressing the increasing problem of TB/MDR-TB related to cross-border and migration in the Greater Mekong sub-region, which encompasses Cambodia, Laos, Myanmar, Thailand and Vietnam. The grant is also open to other relevant countries. The ceiling for this stream is $10 million. The HIV priority areas focus on sustainability of services for key populations, and involve supporting the development, innovative delivery of services and sustainability of community-led service delivery and monitoring through: (a) supporting regional advocacy; (b) addressing legal barriers to access to services; and (c) laying the groundwork for continuity of services as part of a transition process. The Global Fund said that a consultation process to identify gaps and lessons learned from national and regional investments will be conducted in each region. It is expected that these consultations will result in suggestions for appropriate interventions to meet the strategic priority of sustainability of services for key populations. There is one additional priority area – the elimination of malaria in Southern Africa – where the Global Fund has not yet decided whether to pre-identify an applicant or go with a competitive process. The decision will be made in the fourth quarter of this year. The aim of this priority is to support the global technical strategy goal of eliminating malaria in low burden countries in Southern Africa: four front-line countries (South Africa, Botswana, Swaziland and Namibia) and four second-line countries (Angola, Mozambique, Zambia and Zimbabwe). The funding ceiling for this priority area is $20 million. All multi-country grants will be for three-year period. The Technical Review Panel will assess all funding requests that are deemed eligible and will recommend which ones should proceed to grant-making. As is the case for country funding requests, regional applicants are encouraged to prepare a prioritized above-allocation request. This ensures that multi-country programs will have “pre-approved” interventions to integrate into grants when savings or efficiencies are found during grant-making or if other funding becomes available. At the same time, however, the Fund encourages multi-country applicants to take into account the “limitations” of funding available for multi-country priorities. The guidance note provides a list of people to contact in the Secretariat for more information on each of the priority areas. During the 2014-2016 funding cycle, the Global Fund distinguished between multi-country grants (typically groups of small island economies funded through country allocations) and regional grants (which brought together a number of countries and were funded through a separate pool of funds). For the 2017-2019 cycle, the term “multi-country” is now used to refer to both types of grants. However, funding for the small island economies type of multi-country grants comes from the country allocations themselves and so is not included in the $260 million allocated to multi-country priorities. What will happen to current regional programs? There are currently 34 such programs supported by the Global Fund. Many of the programs are not scheduled to end until 2018 or 2019, but some will end in 2017. Presumably, many of these programs will simply lapse. However, as noted above, some of the pre-identified applicants could be organizations that are currently implementing regional programs. In addition, organizations that are currently implementing regional programs will have the opportunity of responding to requests for proposals for those priority areas that are being addressed through competitive applications.